Kirsten Ley, a Collingwood alumnus, is an amazing artist who creates work to inspire and empower women. She wants to spread her idea that women are strong, powerful, and independent. Not only does she design her own line of clothing, but she is also a certified yoga instructor and a very talented artist. Kirsten was raised in a Danish household. Since her father is from Denmark, she grew up being very familiar with the Danish way of life. She grew up with strict timelines, and learned to be organized and to manage her time well. She attributes the success of her collections to her organizational skills that reflect that she is dedicated and focused on her goals. She wakes up at 5am everyday and is able to manage her time well to be able to do what she wants to do. Her dedication has evidently paid off in her recent collections and she believes that this has given her the ability to work for hours on end with one main goal: to express her vision. Aside from being a designer, Kirsten is also a certified yoga teacher and teaches yoga every morning at 6am. She also enjoys creating art with watercolors and gouache. Besides being a visual artist, she is also a working actress who has recently traveled to LA to shoot a feature film in which she played the title role. In regards to her fashion designs, Kirsten’s interest in European history is a significant inspiration for her. Skirts worn by significant figures such as Marie Antoinette inspire her designs. She believes that in order to create fashion, we must look back in time before we can move forward – and that historical research is critical in the design process. Her philosophy on art is simple: it is an expression of the artist’s deepest emotions that cannot be expressed in any other way. Sometimes she feels that she is unable to express her emotions in her everyday life, but once she starts to create art, she is able to allow her emotions and hidden feelings to surface. She believes that art is an amazing outlet through which artists can purge their inner turmoil and in this way, serve as a type of therapy. Art allows her to have freedom to express her thoughts. Art, for Kirsten, can be anything – from a painting to a performance piece. Kirsten believes that art is within all of us, but only a few of us have the freedom to express themselves or are in-tune enough with themselves to be expressed through a form of art. Art is an experience and Kirsten thinks that true art should never be monetized. Creating art for the sole purpose of creating a profit can change the course of the artist’s work in a negative way. True art emerges when you create it from a genuine emotion or feeling. Many things inspire Kirsten: her personal experiences from her past, past and present relationships, and even the simplest things like a raindrop. Sometimes, Kirsten draws inspiration from history and the past, and sometimes from the present political and social scene. She believes that anything and everything can be a source of inspiration through the creative process of an artist. “Inspiration is all around us. We just need to open our eyes and reflect it within our hearts”, she says. Kirsten’s latest collection entitled, “The Unbearable Lightness of Being” is inspired by her personal experience of growing up within the confines of a back brace as a young adolescent. This collection explores the boundaries of physical elements by using leather that has been molded into pieces of human armour, which juxtaposes the flowy silk that represents the act of breaking free from the boundaries. Her collection plays with the idea of an eternal return and escaping from the confines of a routine and pre-disposition. 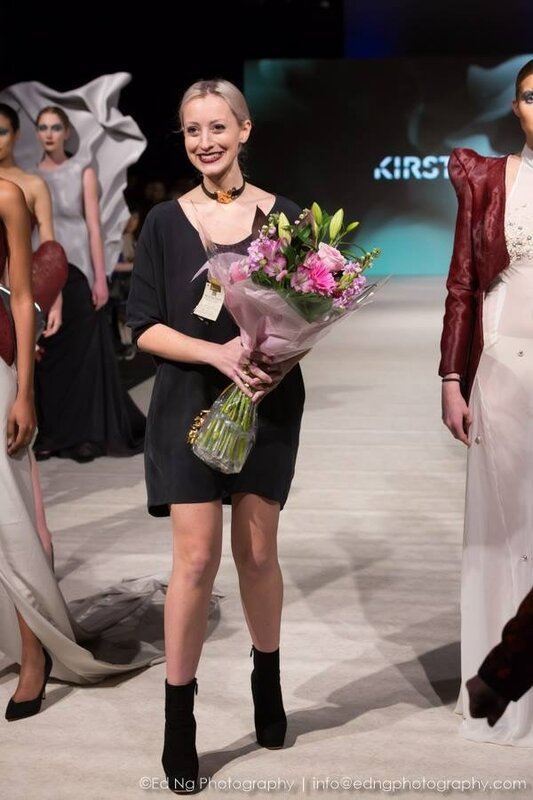 This beautiful collection was showcased and celebrated at this year’s Vancouver Fashion Week on March 22nd!